How do you become an entrepreneur? What are the skills needed to succeed? And where do you go to cultivate them? One thing entrepreneurs from all over the world seem to have in common, in spite of their very different entrepreneurial experiences, is that they learned their best lessons from trying, failing, and trying again. To give entrepreneurs the education we wish we had, we launched a new Bachelor in Entrepreneurship and Innovation at our school, the Global School for Entrepreneurship. This school is exciting, dynamic, hands-on, interactive, personalized, and gives students real life possibilities and opportunities. If the first week of our new bachelor is any indication, the next years are going to be full of challenges and personal growth for us and for our students. Among other things, what makes this school stand out is its new formula, where students learn from real entrepreneurs, in startup hubs all over the world with a focus on practical examination other than theoretical memorization tests. At the end of their bachelor, students are expected to have not only a diploma, but their own business. Innovation is at our core and we understand that constantly adapting and testing is important, but so is giving new innovations a platform to thrive. Which is exactly what happened during the students first introduction week. The first week was all about stepping out of your comfort zone and facing your fears. The students had sessions that confronted them on a personal level and developed a safe, open and honest environment in which everything can and should be said. They also had several workshops on, for example, the use of voice and impact of posture, and motivational talks from entrepreneurs and future teachers. The students were very happy about the content of the introduction week. “I’m excited to be part of something so forward-thinking” said one of them. “Education at GSE is completely tailored to my needs, I am taken seriously from day one and get more attention than I did at my previous bachelor”, complimented another. One of the activities was led by a student of the School, Vincent, who already has his own business up and running. 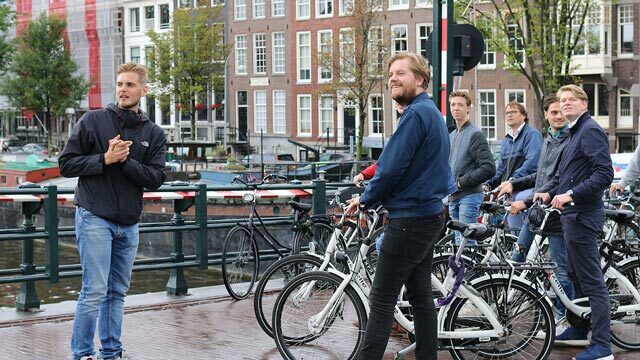 He started a cycling tour of Amsterdam Oost, which shows the tourists the Amsterdam known by the locals and takes them to try out different types of food and meet entrepreneurs from different cultures. According to Vincent, he and his co-founder started this tour very modestly, with a couple of bikes and now grew to a real business opportunity. They have connections with bike shops, entrepreneurs from the region and help bring economic advancement to an area usually not explored by tourists. But that is not enough for him, he wants to learn how to scale and improve his business even more, that’s why he came to the GSE. After such an exciting first week, students are enthusiastic to start their education. The hands-on approach is the biggest characteristic of the school. 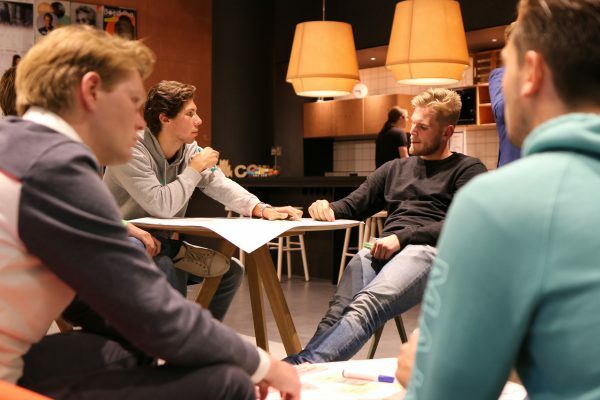 Not only are they taught by real entrepreneurs, but each group of students will have their own Learning Coach who will guide them through their entire study at GSE. This ensures impact and growth as student and entrepreneur. Their learning modules are also different from traditional schools, they have 5 weeks modules, which focuses on specific aspects of entrepreneurship. This was also something the students were happy about, according to them, it’s much better to be able to focus in one aspect for a small amount of time than in many aspects for an entire semester, as it usually is. The school emphasises the importance of experience-based learning and integrating the students into the business world during their four year bachelor. 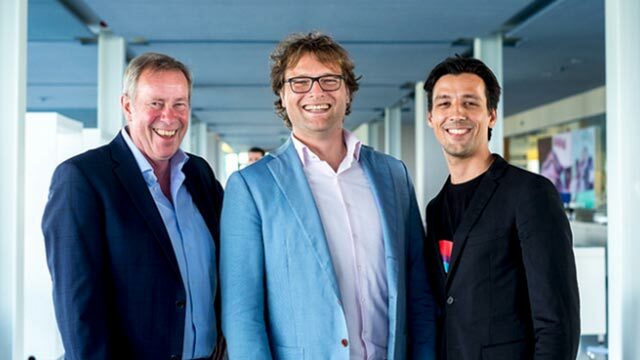 “I’ve met thousands of entrepreneurs through my work with Get in the Ring and every one of them will tell you that you don’t build a business from reading a theory book about entrepreneurship”, says co-founder Hendrik Halbe. So, what made us – a Global Innovation Marketplace – want to set up a school and prepare a new generation of entrepreneurs? Entrepreneurship is a difficult game, and to get ahead future leaders will need to develop the skills needed to succeed much quicker than before. We want to give entrepreneurs the education we wish we had, and to fuse the business and education worlds so that they create worthwhile connections and test their business ideas at an earlier stage. Often failure can’t be avoided, and is something most entrepreneurs recommend, but if we can help reduce the rate of failed entrepreneurs, that would be a great achievement. But how is our school different? We’ve developed a new educational formula together with startups, corporates and academic leaders which we believe is revolutionary. There are no memory testing exam. We focus on practical appliance. 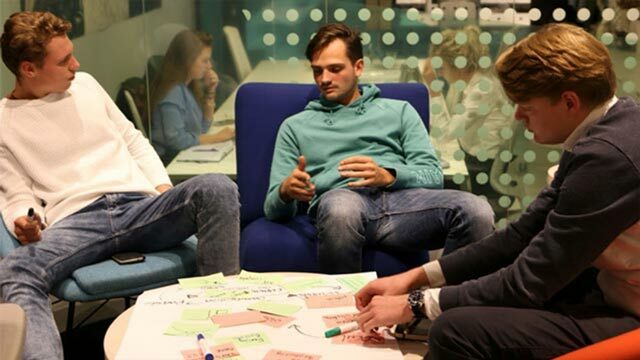 During our four year bachelor, students can study and build their own startup business simultaneously.